More information about the board and its features can be found at the Adafruit Feather nRF52 Bluefruit Learning Guide . The Nordic Semiconductor Documentation library  contains the processor’s information and the datasheet. The Adafruit Feather nRF52 Bluefruit Learning Guide  has detailed information about the board including pinouts  and the schematic . This board version is the recommended one to use. It has the SWD header already populated and comes with the Mynewt serial bootloader installed by default. This board is identical to the board above, but the SWD header is not populated and ships with an Arduino friendly bootloader. To be able to work with this version a 2*5pin 0.5” SWD header (e.g. Adafruit SWD connector ) needs to be soldered. Applications for the nrf52_adafruit_feather board configuration can be built and flashed in the usual way (see Build an Application and Run an Application for more details); however, the standard debugging targets are not currently available. 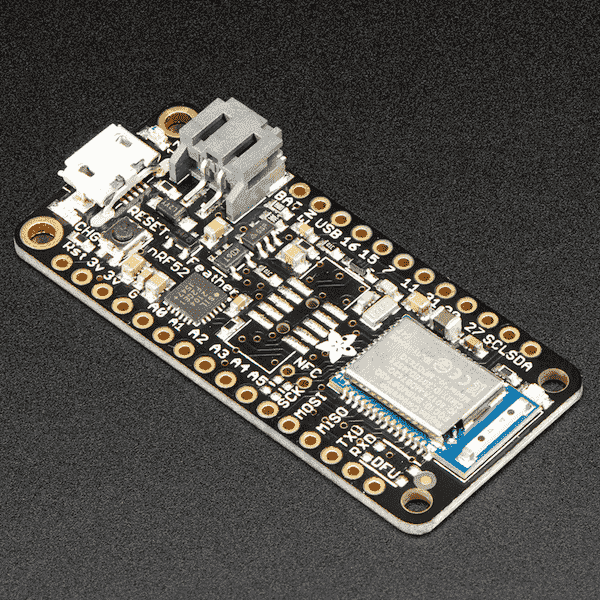 Flashing Zephyr onto the nrf52_adafruit_feather board requires an external J-Link programmer. The programmer is attached to the X1 SWD header. Replace <tty_device> with the port where the nRF52 Adafruit Feather board can be found. For example, under Linux, /dev/ttyUSB0. You should see “Hello World! arm” in your terminal. The nrf52_adafruit_feather board does not have an on-board J-Link debug IC as some nRF5x development boards, however, instructions from the Nordic nRF5x Segger J-Link page also apply to this board, with the additional step of connecting an external debugger. You can build and flash the examples to make sure Zephyr is running correctly on your board. The button and LED definitions can be found in boards/arm/nrf52_adafruit_feather/board.h.